Inkdependence reviewed Toucan Violet, a light purple with low saturation. FpQuest reviewed Montblanc Corn Poppy Red and received the Nexus pen from Kickstarter. I'm beginning to regret that I passed that one up. Pentulant reviewed Noodler's Hunter Green. I might have to buy a sample. 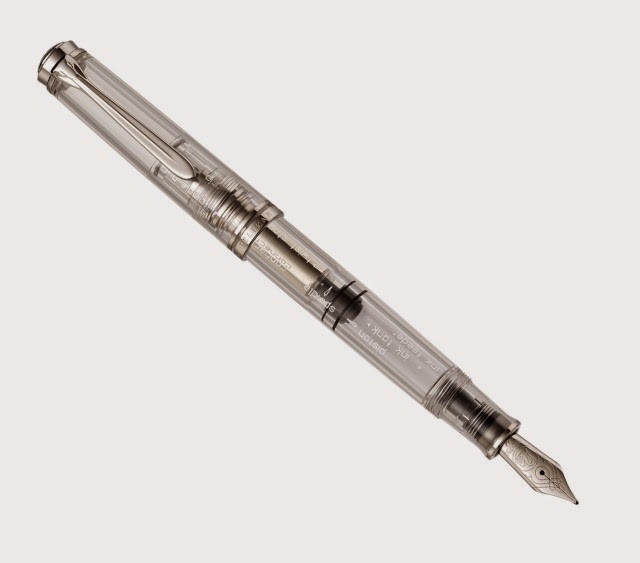 The Pen Chalet is giving away three prizes for March, a Conklin Herringbone fountain pen, a Sheaffer 300 Ferrari Ballpoint gift set, and a Monteverde Artista fountain pen. Details are here. @randomthinks on Instagram is running a give-away to "kill winter with orange" for a chance to win a Lamy Al-Star, a Conklin All American, or a Rosetta Napoleon II. Scroll down in his posts to find one givi details on how to enter. Iguana Sell announced a Pelikan M805 demonstrator yesterday, which will come in two different versions: one completely clear and one with labels for each part engraved on the clear resin. The Pelikan M200 Café Crème recently became available for purchase, and the M805 Stresemann is available for pre-order. Nakaya now produces desk pens in their Ama-Iro finish. Bexley's Phoenix pens are now available. I personally don't like the combination of a swirled resin cap with a demonstrator body; but someone might. Ebouya pens have begun to appear on the American market. Their pens are handcrafted like Nakaya's but at lower prices. There's now a white Visconti Pininfarina. The fire blue Kaweco Liliput is back in stock at JetPens and soon will be out of stock again. Pelikan Edelstein Amethyst is slated for release in the coming weeks. The Lamy Al-Star in copper orange is now available, but I'm personally more interested in the copper orange ink. Made by 68 contacted me recently about their Pen Box 001, a beautifully designed piece for holding two pens along with two cartridges. Truly amazing. I think each pens are made nicely. Glad to know when & where these pens will be available. What a great post it is and I'm delightfully enjoyed reading further reading February. Thanks.